Before I get to the bitterness, let me just qualify something about the Tottenham vs Manchester City game – in the opening half an hour, Manuel Pelligrini’s men played the most impressive attacking football I have ever witnessed and, in particular, Sergio Aguero appeared able to carve through the Spurs defence at will. They did not just deserve their 1-0 lead at that point, it could have been five and should have been at least three: Aguero’s run into the box, reminiscent of his title-winning goal against Queens Park Rangers on the final day of the 2011/12 campaign, ended in a shot coming back off the inside of the post; plus Edin Dzeko had a handful of chances that he should have done better with. In the last 15 minutes of the first half however, Tottenham actually showed some fight – something they had completely failed to do in their drubbing at the Etihad earlier in the season – and even found the net from a set-play, but Michael Dawson was adjudged to have been offside (replays suggested at the moment Christian Eriksen took the free-kick, the Spurs captain may have been level, but there was also a slight touch from Emmanuel Adebayor at which point Dawson was clearly offside). Tackles were flying in and for a while, it looked as though City were actually rattled by this approach. At the break, I found myself thinking that even if I still believed we would lose the game, at least Tottenham were not going down without a fight. In the lead up to the Big Game (as referred to in all commercials, but by nobody else ever) I thought it was appropriate to mine the views of NFL experts to get a more rounded view of the Championship Round and who is likely to win the Super Bowl. So I reached out to some of the more tenured writers and asked them to share a version of their weekly columns for my own site – somewhat surprisingly*, they all agreed! As I was walking across the turf at Sports Authority Stadium at Mile High after watching Peyton’s first workout session of the pre-season last July, I remember running into Clive Warren, one of the men behind the success of the Denver Broncos. Warren is not as well-known as Manning, or any of the other players or coaches, but he still contributes a useful role in the organization. He’s the man who cleans Bucky, the Bronco statue that sits atop the south scoreboard and has been a fixture of Denver’s home stadium since 1975. 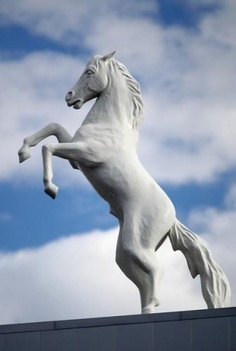 Clive has been in charge of cleaning the 1600 pound, 27 feet tall, fibre glass and steel statue from the beginning and it tells him it reminds him of a horse he used to look after on the farm he grew up on in Nebraska six decades ago. “I told Peyton all about that farm and the horse” Clive told me, “he said that the next time he is in Omaha, he will go visit”. Seems like that story has been on Manning’s mind ever since. Because I have given Richard Sherman a column on my Grantland-wannabe website – I feel completely justified in saying that I did not like his post-game rant when he had the audacity to be pumped up and excited, minutes after making the play that took his team to the Super Bowl at the expense of their biggest rival. I thought Sherman should not have been calling out an opponent and that his post-game interview was offensive (hence why a defensive player is given the OPOW award). Even if he hadn’t made 14 tackles, including a sack, I’d definitely have given this award to Bowman because he suffered a heart-breaking injury and it gives me the opportunity to talk about how brave he is. Lot of focus on the fact that the Super Bowl is coming to New York, but in fact the game will actually be played in East Rutherford, New Jersey. Not a great time for NJ Governor Chris Christie to be embroiled in scandal with all of the nation’s sports media coming to town. Peyton Manning vs Russell Wilson – now there’s a quarterback matchup I’m looking forward to watching. Hard luck for Tom Brady and the New England Patriots – he’s been a helluva quarterback, but no rings in 9 years now. Jim Harbaugh misses out again, but has taken the 49ers to three straight NFC Championship games. When I talked to him in the locker room after the loss to Seattle he was downbeat but assured me “We’ll be back Peter my old buddy, you can quote me on that”. I had a pumpkin-infused, hop-filled, one-of-a-kind, made especially for me IPA from a small craft brewery outside of Denver during Championship weekend – not as good as the offerings available in Boston, but not a bad beer to go with the unseasonably warm weather. Heading into one of the Starbucks by the NBC Studios at Rockefeller Center, the barista looked at me blankly and asked for my order and name to go on the cup, even though I have been in there several times over the last year and was even recognized by someone in the line. “Will this go in your coffee section, Peter?” they asked, sadly it will and the vanilla latte (with pumpkin-infusion) was far from the best I’ve had from Starbucks stores. John Tyler, the 10th President of the United States – as of 2012 – still had two living grandsons, even though he was born in 1790. I know this has nothing to do with football, but have I mentioned i have a Hall of Fame vote recently? This week promises to be a crucial one in the three big races that are going on in the Premiership this season, with a full round of fixtures on Tuesday and Wednesday, followed by the closing of the January transfer window on Friday evening. Although big mid-season deals have proven to be rare and not too successful in recent seasons, several clubs could benefit from bringing in the right player and in particular, those in the relegation dogfight will be hoping to bring in someone who can provide firepower to lift a side away from the danger of dropping out of the Premiership. Let’s look at the three big battles to be played out over the rest of this campaign and who each team faces in the midweek round of fixtures. Not Drew Brees throwing a pass for the Saints, what could go wrong? 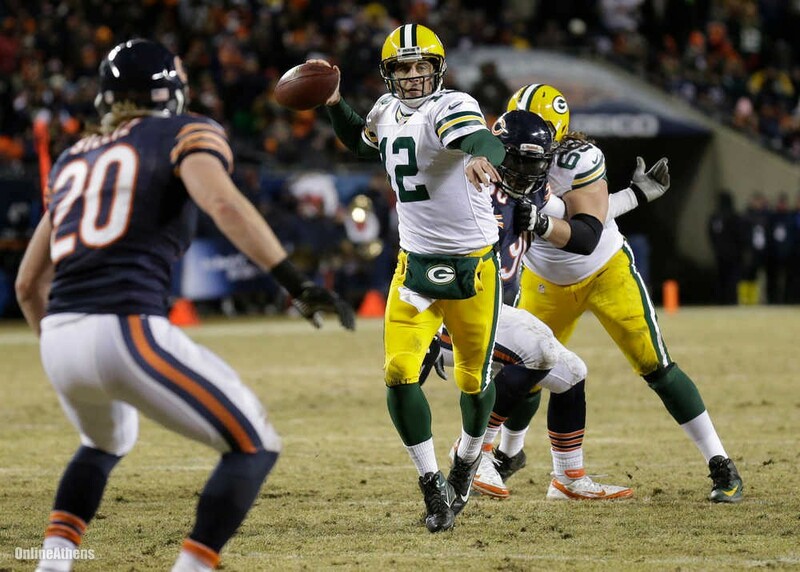 A week after one of the most exciting playoff weekends in the NFL, the Divisional Round of the 2013 season was one that lacked the excitement and shocks of recent years. For the first time in a decade, all four favorites heading into the second weekend of the postseason won their contests to progress to the championship games and none of the match ups were particularly close. After three-quarters, the closest game was New England against Indianapolis, where the Patriots led the Colts 29-22 with 15 minutes to play, but after that they scored 14 unanswered points to have the largest margin of victory of the weekend, 43-22. The other three contests of the divisional round all saw fourth quarter comebacks by the underdogs, though on each occasion they fell short of causing an upset. Perhaps the closest was the least likely, as the Saints rallied from 16-0 and 23-8 down to score a touchdown with 26 seconds left and then recovered an onside kick to get the ball back. On what should have been the second to last play, Drew Brees threw a pass to Marques Colston on the sideline and, if the wide receiver had simply stepped out-of-bounds, they would have been able to run one more down to try to get into the end zone. 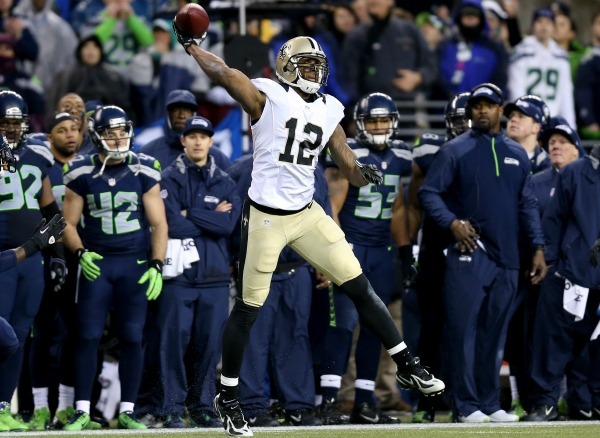 However, Colston – for inexplicable reasons – decided to keep the play alive as if time had already run out and attempted a cross-field lateral that not only failed to find its target, but was also thrown forward, thus bringing a penalty flag and a run-off of the remaining time on the clock, ensuring the Seahawks progressed to the NFC Championship Game. Seattle’s opponents in that game will be the 49ers, who followed up their victory in Green Bay with a 23-10 defeat of the Carolina Panthers, who had beaten them in San Francisco earlier in the season. 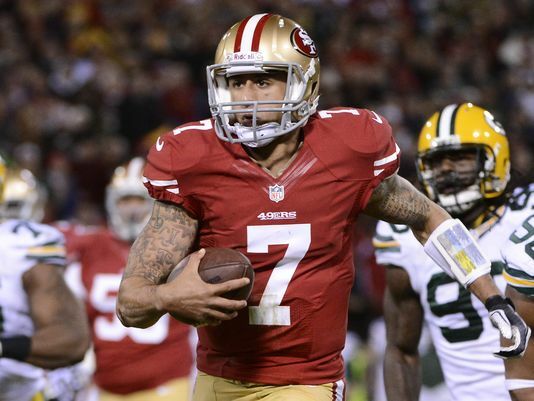 Although Colin Kaepernick had nowhere near as dominant a performance as he had against the Packers in the Wild Card round, he still threw one touchdown pass and got another on the ground, which gave him the opportunity to mimic Cam Newton’s Superman style celebration, a reference to the fact that the Panthers quarterback had been selected first – 35 slots ahead of Kaepernick – in the 2011 draft. However, the real super hero in this 49ers renaissance is Jim Harbaugh, who has taken San Francisco to the NFC Championship Game in all three of his seasons as head coach and has the opportunity to reach the Super Bowl for a second straight year. Last weekend’s round of fixtures in the Premiership will have to go down as one of the most boring in recent history. There were no big surprises, no real back-and-forth games and even Stoke vs Liverpool – which ended up 5-3 to the Reds – was far from being as exciting as the scoreline suggests. The clubs that comprised the top seven going into the weekend all won; of those, Arsenal were the only ones who did not win by two goals; while only West Ham and Sunderland enjoyed victories over teams (Cardiff and Fulham) who had started the match higher in the table than them. 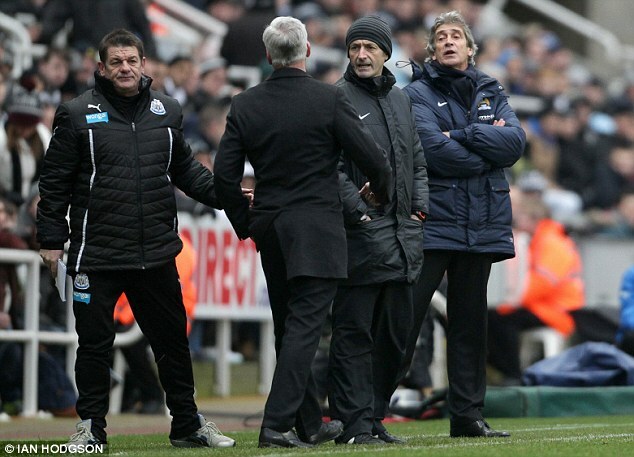 Outside of Newcastle – who sat in 8th at the beginning of play and were thus the highest placed team to lose, 2-0 to Manchester City – having a goal disallowed for a questionable offside call, then their manager, Alan Pardew, calling his opposite number, Manuel Pelligrini a f*cking old c*nt (for which he later apologized at least), there was not much in the way of controversy either. embarrassing thing to happen to Puncheon in a Premier League match, despite last season in a game for Southampton against Everton, him having to leave the pitch in the second half to answer the call of nature, which became the subject of chants from the Saints fans. Elsewhere, Sunderland moved off the bottom with a 4-1 win at Fulham, in main part thanks to a hat-trick by Adam Johnson; Southampton got just their second victory in ten matches as they beat West Brom 1-0 at St. Mary’s; Arsenal got revenge for their opening day defeat to Aston Villa as they won 2-1 on Monday night; and as mentioned above, Liverpool gave up a two goal lead in the first half, but recovered to beat Stoke, 5-3. The dominance of the teams in the top third of the table last weekend was a reflection on how there are really three separate mini-leagues in the Premiership this season. At the top, you have three clubs who are competing for the title, currently separated by two points: Arsenal, Chelsea and Manchester City. After that comes a group of four teams aiming to finish in the Champions League places: Liverpool – who might still harbor ambitions of winning their first championship since 1989/90, but seem unlikely to usurp all three of the sides above them – Everton, Tottenham and Manchester United. Then – after Newcastle and Southampton who are both in something of a no-man’s land, unlikely to be involved in the European race, but too far above the rest to drop too far – comes the relegation scrap, which this season sees 11 teams at risk of dropping out of the division. Thanks to Sunderland’s recent revival, no club has yet been cut adrift and a string of victories could see any of the bottom three propelled into mid table, while Hull and Aston Villa – who are in 10th and 11th places respectively, but only five points above the drop zone – need to avoid a run of bad results that could see them plummet in the standings. All of the bottom 11 – Hull, Villa, Stoke, Swansea, West Brom, Norwich, Fulham, West Ham, Cardiff, Sunderland and Crystal Palace – have won between 4 and 6 of the 21 fixtures thus far and, with 17 more remaining, any of those three could find themselves relegated by the end of the season in May. 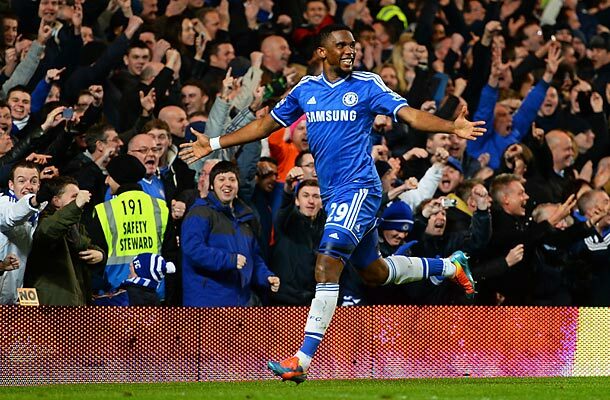 This weekend, the standout fixture is Chelsea versus Manchester United at Stamford Bridge, though that contest does not quite have the same importance as it has in recent years, as only the home side are among the title contenders this season. With that match being played on Sunday at 4pm local time, both Arsenal and Manchester City will have the opportunity to put pressure on the Blues as they both have home matches on Saturday against Fulham and Cardiff respectively. Elsewhere, with these fixtures being a reversal of the games from the second week of the season, Spurs travel to Swansea; Liverpool host Aston Villa; West Brom entertain Everton; and Newcastle have an away match against West Ham. At the bottom, Crystal Palace take on Stoke; Norwich and Hull meet at Carrow Road; and Sunderland face Southampton in the early kick-off on Saturday. If there was anywhere else I could begin in the roundup of the two different cup competitions, other than with the North London derby, then I definitely would. However, it was the biggest tie and therefore the obvious place to start, so let’s just get it out of the way: Arsenal scored twice and Tottenham never looked like responding as soon as Santi Cazorla had given the home side the lead, especially since Emmanuel Adebayor went back to looking like the disinterested striker who was on the fringes of the club for the last season and a half. 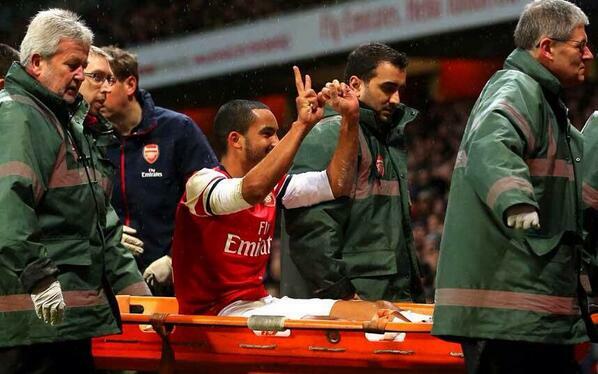 All the headlines went to an incident late in the game when Theo Walcott gestured to the Spurs fans while he was being stretchered off around the pitch, as he was responding to abuse from the traveling supporters, by displaying the 2-0 scoreline with his fingers. Now, shouting non-racist, non-homophobic things at opposition players is part of the game and Walcott’s response – even as a die-hard Spurs fan – I actually found funny and good-natured (it should not incite the crowd, since it was banter not hateful), but then Tottenham supporters responded by throwing things at the Arsenal player, which is completely unacceptable. Unfortunately for Gooners and England fans, Walcott was subsequently ruled out for the rest of the season and the World Cup as he suffered a ruptured ACL in his left knee, but the FA have – sensibly – also advised he will not face any punishment for his 2-0 gesture towards the Tottenham crowd. Nottingham Forest thrashed an inexperienced West Ham side 5-0 at the City Ground and the pressure on Hammers boss Sam Allardyce increased in midweek when his team put in another lackluster display as they were beaten 6-0 by Manchester City and the Etihad. That made it game, set and match for City, who have now racked up three tennis set style wins over London opposition as they also defeated Tottenham 6-0 and Arsenal 6-3 at home; but they face a replay in their third-round FA Cup tie, as they were held 1-1 by Championship side Blackburn at Ewood Park last Saturday. David Moyes is facing increased scrutiny of his suitability as manager at Manchester United, as they were knocked out of the FA Cup by Swansea, who won 2-1 at Old Trafford; then lost 2-1 in the first leg of their League Cup semi-final away at Sunderland. League Two’s Rochdale United caused a deserved outset by outplaying Leeds and beating them 2-0, while Sheffield United ousted Aston Villa and Milton Keynes Dons earned a 3-3 draw at last year’s winners Wigan in the other games that saw lower division sides enjoy impressive results. Chelsea, Liverpool, Everton and Hull all progressed without too much trouble, while Ole Gunnar Solksjær had a victory in his first match in charge of Cardiff, as he watched his new troops beat Newcastle, 2-1 at the Stadium of Light. This week sees all of the fixtures from the opening weekend of the season reversed, so for example, Tottenham travelled to Crystal Palace for their first match of the campaign and this Saturday they will host the Eagles at White Hart Lane. To preview the action, let’s look at the match reports (either the BBC’s or Guardian’s, since those are the two I read) from those opening games and see how much, or little, the narratives have changed around each club. 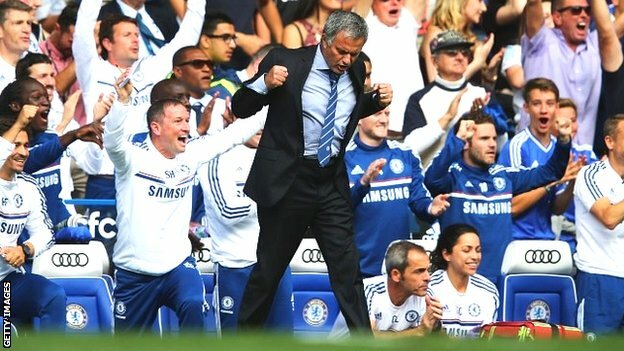 What Has Happened Since: Chelsea may not have kept up such stylish performances, but they are only two points off the lead and if they can add a striker who scores a lot of goals – or get one of Fernando Torres, Demba Ba or Samuel Eto’o to find the net more regularly – then they could win the title come May. Hull have improved on that opening game and currently sit in 10th place, six points above the relegation zone and, in Tom Huddlestone, they have a player who, on his day, can control matches with his range of passing and shooting – alhough he has only scored once in over two years, he can strike the ball well with either foot from outside the area. For the second consecutive season, Tottenham Hotspur took all three points from their trip to Old Trafford – having previously failed to win there in the Premiership era – this time prevailing by two goals to one. 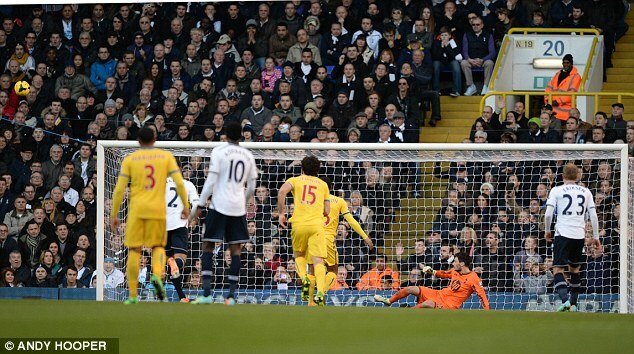 Emmanuel Adebayor scored the first with a perfectly placed header into the bottom corner of David de Gea’s net, though it was made possible thanks to great breakaway play by Roberto Soldado and Christian Eriksen, with the latter providing a pinpoint cross for the Togolese striker; then the Danish midfielder doubled the lead with his second goal in three games. 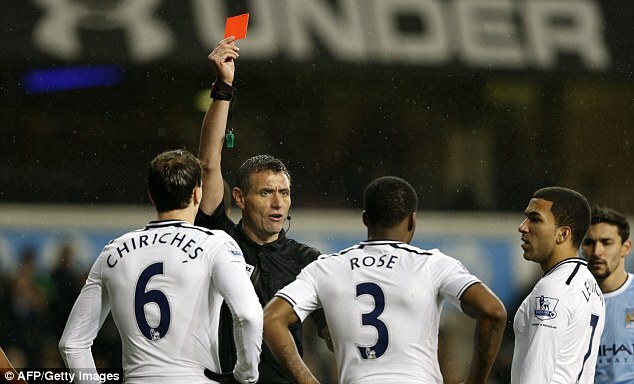 What was particularly impressive in this victory – which gives Tim Sherwood three wins and a draw in his first four Premiership matches as Spurs manager – is that the team were far from their best, but refused to buckle under the pressure that Manchester United threw at them as they sought an equalizer. United had cut the deficit back to one immediately after Eriksen’s headed goal thanks to a smart finish by Danny Welbeck, but Spurs held strong in the final twenty minutes and were able to pick up a vital three points to move within two of the Champions League place, with the league now taking a brief hiatus while the FA Cup takes center stage this weekend.